Splitter VLVSP3402, HDMI-2xHDMI, black, Ultra HD Splitter VLVSP3402 with HDMI input and two HDMI outputs, black, 3D and Ultra HD(3840x2160) support and USB power cable. Adapter DP M to HDMI F, black, 0.15m Adapter cable from DP/M-HDMI/F cable length 0.15 m, 4K, black. List Price: 5.60лв. VAT Incl. 200mm HDMI - Micro HDMI Adapter cable Adapter cable from HDMI F - Micro HDMI M cable length 200 mm. List Price 9.90лв. VAT Incl. 9.41лв. VAT Incl. 8.91лв. VAT Incl. 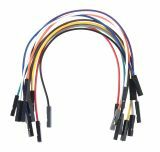 Cables MIKROE-512, 1 pin - jumpers, male-female, 150mm Insulated 1 pin conencting wires with length 150 mm and different colors. Cable adapter, DP / M to DVI / F, 0.15m Cable adapter from DP male to DVI female with a cable length of 0.15 m and black color. Video adapter, mini DP M - HDMI F, DisplayPort F, DVI F, 0.15 m Adapter from Mini DP M to HDMI F Diplayport F, DVI F with 0.15 m cable length. List Price 21.90лв. VAT Incl. 20.80лв. VAT Incl. 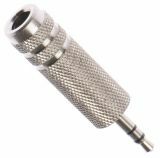 Cable lightning port to 3.5 mm Headphone Jack This adapter lets you connect devices that use a 3.5 mm audio plug to your lightning devices. 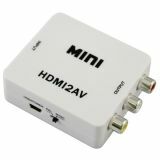 Converter AV to HDMI Converter for AV signal to HDMI. Micro USB to USB TYPE-C adapter Micro USB to USB TYPE-C adapter. List Price 7.50лв. VAT Incl. 7.12лв. VAT Incl. 6.75лв. VAT Incl. Converter VGA to AV Video, S-Video, VGA Converter VGA to AV Video, S-Video and VGA. Adapter, 3.5mm Jack mono F - DIN Adapter, 3.5 mm Jack mono F - DIN. 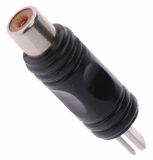 Adapter, 3.5mm stereo М - 6.3mm mono F Adapter, 3.5mm stereo М - 6.3mm mono F, metal. List Price 1.50лв. VAT Incl. 1.42лв. VAT Incl. 1.35лв. VAT Incl. List Price 1.99лв. VAT Incl. 1.89лв. VAT Incl. 1.79лв. VAT Incl. 1.69лв. VAT Incl. Adapter, mini USB F - micro USB M Adapter, mini USB F - micro USB M fast transfer of signals. HD Video Converter HDMI/f-3xRCA/f, HDMI2AV HD Video adapter HDMI/f to 3 x RCA/f cinch. Adapter RJ-45 to USB Adapter RJ-45 to USB. List Price 11.90лв. VAT Incl. 11.30лв. VAT Incl. 10.71лв. VAT Incl.